Tell me about the thought process that drove you into making that first trip to Iraq, the resources you had at your disposal and how you coped with such dramatically different and dangerous place? "I followed the media coverage of the selling of the war by the Bush administration, and compared that to the UN reports and other reportage I was scanning in foreign media outlets, and knew that this war was based on lies. Watching the mainstream media in the US act as functional propagandists rather than critical journalists, I became enraged. I could barely believe my eyes, watching a war being sold to the American public, as propaganda disguised as news. 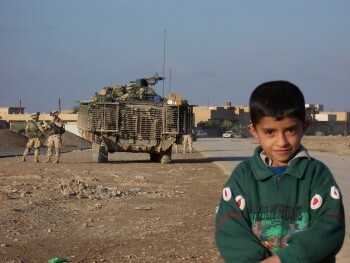 "I felt that as a US citizen the best thing I could do was go report on what I saw myself, so after the invasion took place and the occupation began, (and reporting continued to be horrible overall) I decided to head to Iraq. I had saved $2000, had a laptop and a small digital camera, and made connections with a couple of people in Baghdad via the Indymedia Beirut website. Through a Lebanese man who was in Baghdad writing about what he saw, I obtained the necessary information to get into Baghdad relatively safely. "I had few resources and was totally independent. Luckily, I began to meet just the right people at the perfect times-which is how I met my first interpreter in Baghdad, met other foreign journalists to work with to share costs, and eventually began to get hired and paid to report. "I had previously done a lot of international travel, so going to a new country wasn't terribly difficult for me. However, going into a war zone was different, and certainly took a lot of getting used to." In your book you describe having the feeling that "most people seemed blissfully unaware" of what is going on in Iraq. Some of this you put down to the corporate media, in a sense I think people have a difficulty coming to terms with Iraq because it is all news-flashes lacking a wider context, then there is dis-information on the level of stabilisation and an expert led discussion on geo-politics that dissuades people from trying to get a grip. For those that want to come to terms with what is happening in Iraq, apart from your book where would you advise them to start looking? "First I think it's important that people read about US foreign policy, particularly regarding the Middle East. Read the document the current National Security Strategy (updated 2006) is based on, the Project for the New American Century. Then read the NSS, then the Quadrennial Defense Review Report. Those lay out, quite clearly, US goals for using the military to control strategic oil/gas reserves and transportation lanes around the region. "Then for news, read foreign media, or alternative media. Democracy Now! in the US is good, as is the Independent newspaper in the UK, Al-Jazeera Arabic television, and other good information websites like informationclearinghouse.info. Needless to say, almost all of the best resources people need for tracking what is happening in Iraq are found online. This includes various Indymedia sites around the globe as well." You left Iraq for home just before the transfer of sovereignty, and upon your return you found "Iraq is yet another country" - that was pretty much two years ago, how different again is it now today and what is required for unembedded journalists like yourself to remain safe? "The situation in Iraq degraded so quickly once the occupation began that each and every trip I went back it felt like a different country. I have not returned to Iraq since just after the elections of January 2005. All of the fixers/interpreters I had worked with told me to return would mean almost certain death to me, or to them. Any Iraqi working with a westerner now is seen as a collaborator or as a spy, and will likely be killed or kidnapped. Thus, I decided it would be incredibly selfish of me to return and risk the lives of any Iraqi working with me. "My contacts there tell me it is nearly impossible to work as a western journalist without embedding with the military. I know a few westerners who have gone back recently-and they barely left their hotels. Reporting safely from Iraq now, for an Iraqi or westerner, is impossible. We're now in a position where we must rely on Iraqis to do all the reporting about what is happening in their country." How did Iraqis view the massive anti-war movement that developed around February 15th and in the run up to the invasion and what forms of solidarity from western activists have the most value in the current context? "Iraqis told me they were inspired by the pre-war displays of dissent in the west on that date. I was told repeatedly by Iraqis that they liked the American people, but not their government. Even well into the occupation when the country was disintegrating, Iraqis continued to make the distinction between US citizens and their government. However, a deeply troubling crisis is that that distinction is no longer being made by most Iraqis. They've seen Bush reelected in 2004, and more recently the so-called Democrats win the mid-terms in the US and do nothing but continue to fund and support the occupation. Thus, western activists have their work cut out for them." What do you make of the internal debates in the western left about the nature of the Iraqi resistance and the recent "third camp?" I'm sure you've come across arguments about how the resistance is politically Islamic in composition, and that we should be trying to support a secularist resistance rather than homogenizing support to the resistance with no critical take? "I think the elements of the western left who are engaged in this debate about what is or isn't the legitimate resistance in Iraq haven't a leg to stand on. What I mean by that is that it is the failure of the so-called anti-war movement, particularly in the US, to stop the war from being launched in the first place. Thus, whatever form of resistance used in Iraq, and whoever chooses to participate in it, is of no business of the so-called anti-war movement, particularly when much of that movement continues to support so-called Democrats who continue to fund the occupation. "The Iraqi people have a legitimate right, under international law, to resist the occupation of their country. It was an illegal invasion which contravened the UN charter, and is thus by definition an illegal occupation. There are countless forms of resistance in Iraq today-political, civil, and armed, and they are all legitimate under international law." There's an interesting section in the book where you mention mass dissent against the newly proposed Iraqi flag, with people tearing it down everywhere it was flown and driving occupation forces crazy by putting the old one on display everywhere they could. Can you tell us of some more mass acts of popular resistance to the US forces along these lines? "Across the board Iraqis opposed the occupation. Like the flag example, this took many forms-not giving information to US soldiers about whether or not there were resistance fighters in their area, not supporting the US-backed Iraqi puppet governments (all of them), and doing what they could to report what was actually happening in their country to reporters willing to write it. These were all consistent acts of popular resistance I saw, and which continue today." Have other forms of resistance outside of militarism arose to sea changes like privatization of the oil industry, water supply and so on? "Yes. The oil union workers in Basra continue to play a critical role in staving off the privatization of Iraq's oil infrastructure. Without their strikes, their ability to apply political pressure, as well as their efforts to educate people in the west about what is being done to attempt to control Iraq's oil, it may well have already been privatized. The same can be said, although less obviously, regarding other aspects of Iraq's infrastructure." With companies like Bechtel failing to restore water supplies, you describe how people in an area near Najaf collected funds to repair it themselves - is this sort of self-organised community response to the failure of the occupation a developing theme in Iraq or is it rare? "It is common, but on a micro-scale. One thing that is difficult to impart to the west is how grave the situation in Iraq has become. As brutal as so many of the stories are in my book, it is far worse today. People there are literally in survival mode. So, for example, one person who can afford a generator in a neighborhood gets one. Then they'll run wires to all their neighbors homes to share. The same can be said of someone who can afford some cooking gas, or a doctor in the neighbourhood will treat people there in their homes, etc. Particularly in Baghdad, self-organizing communities are all that is left now, so that is how most people are getting along, and this is spreading all over Iraq as a matter of necessity and survival. It's literally band together as a community or die." In one short section in your book you mention the strategies people have come up with to over-come unemployment, things like re-selling petrol to those sick of waiting in station queues and the like – could you tell us some more about the toil of unemployment in Iraq and how people are faring in this new informal labour economy? "Some of this I've mentioned-doctors are treating neighbors and friends who can't leave their neighborhoods because of the security situation. Engineers are running electrical wires through their communities to share what little electricity there may be. Teachers are teaching locally rather than in schools. These efforts are traded for food or other skills...it is quickly becoming, and in many areas already has become, a barter/trade economy out of necessity." Do you think embedded journalists can play a challenging critical role too in Iraq? I'm thinking for instance of Sean Smith, a UK Guardian journalist who documents the disillusionment and harrowing exhaustion of those fighting in Iraq through his photography? "I think journalists who choose to embed and actually report on what the troops are doing, saying, feeling and thinking, is rare. This article you mention, was one of these rare cases I've seen where the journalist did their job, and did it well. This, with few rare exceptions, does not happen in any of the US papers. We see embeds write maybe about how a soldier misses their family, but nothing more critical than that, for the most part. "I have seen instances of some good, critical reporting from embeds, but it remains the exception. I am confident that if every reporter who embedded actually reported the reality of what they saw, the embed program would be promptly dissolved by the Pentagon-as they are who instituted it and maintain it." Just following on from that do you hear much about problems in the US military, such as break downs in command and resistance from troops to orders? The sort of stuff that really gets down-played as a reason for pulling out in Vietnam but it obviously played some role in the decision to withdraw there. "Morale is very, very low with most US soldiers today. That is according to recent polls conducted by the Army itself, and the most recent Zogby poll which found over 70% of the troops think the occupation should end in less than a year. There have been a few instances of troops refusing orders, but this still does not begin to compare to the rampant dissent seen during Vietnam. Part of this is because there are far fewer troops in Iraq, and the casualty counts are far lower, for now. "The other reason is that what dissent is happening, of course, is getting no media attention. The discussions I have had with troops while in Iraq, in addition to those I've had with troops back home, all point towards low morale, anger towards the US government and misdirected anger towards the Iraqi people. "All the seeds are there to repeat a growing troop resistance movement like we saw in Vietnam-disillusionment, betrayal, anger when troops realize they have been used, exploited and lied-to, poor leadership, being under-equipped....all of this is leading towards a growing troop resistance...which in time I feel confident we'll hear more about, because it will eventually grow too large for even the corporate media to ignore." May I ask what plans you have for yourself after the book publicity run is over? "To return to the Middle East and continue my reporting." The iawm tried to get Dahr to come to the Conference of October 13th but it proved impossible due to his other commitments. One option is to invite him to the national anti-war demonstration planned for Nov. 10th. If that proves impossible we would like, along with other antiwar activists/groups, to organise a national tour and launch oif his book. Anybody interested? Particularly liked the piece where he didn't slur his words in relation to the Third Camp. Anybody interested in what, MichaelY? We would like, along with other antiwar activists/groups, to organise a national tour and launch oif his book. Anyone interested in working with us on this project? I am but a simple minded man. Has the Author been invited to participate in this project yet? If I could just get a word in edgeways through this throng of activists; prithee what is it that you request of the peasantry in this matter? Thanks for fillng the vacuum! If we were to take the view of the editor of the Sunday Times today, we might come away with the impression that NOTHING AT ALL happened in Iraq last week. Perhaps the editors have completely lost confidence in their journalists' ability to find good sources? Or maybe they think the market for news about Iraq has somehow suddenly and completely disappeared? Maybe they think that, if they focus on Burma instead, their readers will forget about the ongoing humanitarian catastrophe and the ongoing humiliation of the US and its allies (that's us!) in Iraq? Or maybe they've just gotten bored and are past caring what their readers want? In any case, it's good to see some commentary about Dahr Jamail here, to fill the vacuum left by the carbon-based media. Something did happen in Iraq last week! "If we were to take the view of the editor of the Sunday Times today, we might come away with the impression that NOTHING AT ALL happened in Iraq last week." sayeth Colin the mouthpiece for the surrender monkey brigade. You and The Sunday Times are incorrect Colin, something did happen in Iraq last week. If you look at other sources "we" the American warfighters wacked over 60 terrorists using airpower and just plain old boots on the ground. You sit around smugly doing your armchair quarterbacking Colin while the folks with the guts to stand up against terrorism are holding back the Islamic tide. How come you cowards only thrive on blaring out the bad news and turn a blind eye on good news? situation in Iraq and that article seems particularly slanted. The foreign editor of "Prospect" magazine has also spent time there with the Al Sadr people not confining himself to the Green Zone by any means and is optimistic for the future. The link below is an article with a summation of his conclusions. There is no reason to regard his conclusions as biased as he not an ideologue. Bartle Bull is not biased? Propect magazine is not biased? They of the "Mature, educated, affluent readers"
Maybe Bertie is a socialist after all !!! Thanks for trying to bring a bit of mirth to a gloomy Monday morning. Animal Mother, I agree that the editors of the Sunday papers have got it wrong if they think nothing happened in Iraq last week. For example, Moqtada al-Sadr, leader of the Mahdi Army, and Abdel Aziz al-Hakim, leader of the Supreme Iraqi Islamic Council and the Badr Brigades, have called a truce. This is good news, because it means that, despite the divisive conditions the occupying powers have imposed with their federal constitution, their ethnic and sectarian quotas for election, their fickle support for different factions, etc., the most powerful Iraqis are pursuing unity, peace and stability - their own way. About courage and cowardice: I wouldn't for a moment question the courage of the people wearing those boots on the ground you mention. I have a friend, Jimmy Massey, who fought as a Marine on the ground in Baghdad, and I know him as a man with the heart of a lion - both courageous and compassionate. But, unfortunately, Animal Mother, you can whack all the terrorists you like in Iraq and that won't make your people back home any safer. Even if you could completely eliminate Al-Qaeda in Iraq that would not stop autonomous Al-Qaeda cells in North Africa or London or Warsaw or Sydney or Brooklyn from planning further attacks. So you risk losing your life fighting Al-Qaeda overseas, and for what? Just so George Bush can save face and refuse to admit he made a catastrophic mistake? That's bad news. It's a shame that your president has sent courageous people like you, Animal Mother, to provide an excuse for Islamist fighters to enter Iraq and enjoy perfect conditions under which to train to overthrow this same president's close friends in the kingdom of Saudi Arabia. If you could leave, the Iraqis would deal with the foreign fighters, as Sheikh Abdul Sittar Bezea al-Rishawi's people are doing in Anbar. Animal Mother, I accept that I am an armchair quarterback. I have the great privilege of being a doctor, well paid and well fed, living in a country that is at peace. The least I can do in return for this privilege is to work to save people like you from being killed or disabled for life in a useless war. I hope you get home safe, very soon. "You sit around smugly doing your armchair quarterbacking Colin while the folks with the guts to stand up against terrorism are holding back the Islamic tide." Personally I'll back the 'armchair quarterbacking Colin' rather than yet another clueless apologist. Seeing as there was no Al Qaeda link with Iraq previous to the invasion, and the American presence is generally reported to have increased support for 'Islamic terrorism' worldwide, perhaps you might explain exactly what your comment has to do with the article above. Or indeed reality generally. You are wrong about Prospect magazine. It is an erudite left of center magazine which recently included Chomsky in its one hundred most important intellectuals. To be going on like the other writer about a simplistic paradigm of occupation and resistance is just self delusion at this stage. The board of the Transnational Foundation includes Hans von Sponeck, who was the UN's Humanitarian Coordinator (head of the Oil-for-Food Programme) in Iraq 1998-2000. Perhaps unsurprisingly, this genuinely peace-oriented 2008 Presidential candidate – son of a Croatian-American truck driver and a former Mayor of Cleveland - receives little attention in the United States and is virtually unknown in Europe. (5)"
I haven't seen any reporting at all of Kucinich's presidential campaign in the Irish media. And, apart from a letter from me to the Irish Times on the subject, I haven't seen any of the old media in Ireland covering the TFF's ten-point plan. There's lots of interesting ground the traditional media could cover if the journalists and editors were prepared to do the elbow work. If any takers, I can give you phone numbers for Hans von Sponeck and Jan Oberg of TFF. "You are wrong about Prospect magazine. It is an erudite left of center magazine which recently included Chomsky in its one hundred most important intellectuals". The following is what Trevor Phillips, Chairperson, British Commission for Racial Equality, had to say about views expressed by David Goodhart of Prospect magazine. "Is this the wit and wisdom of Enoch Powell? Jottings from the BNP leader's weblog?... The xenophobes should come clean. Their argument is not about immigration at all. They are liberal Powellites: what really bothers them is race and culture." "The litany of (moral) decline is depressingly familiar-about 30 per cent of children are currently born to unmarried mothers (245,700 in 1995) and nearly 20 per cent live in a single parent household"
Not surprising views to come from a paid up member of the British Conservative Party.